Anthony Boudain, BJJ master. Ok, maybe not. But at least he's trying. 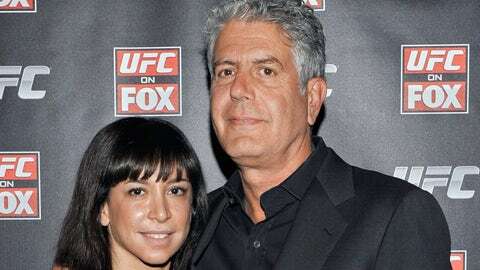 Television personality Anthony Bourdain just started training in Brazilian jiu-jitsu over the summer and he already has earned his first stripe. The celebrity chef, who has hosted shows on the Travel Channel and CNN, posted a photo Thursday on Facebook of his coach, Igor Gracie, granting him the honor at Renzo Gracie Academy in New York City. Bourdain, 57, got into BJJ the same way most men get started at anything — a woman put him up to it. The lovely lady in this case was Ottavia, his wife, who has been a dedicated student of the martial art at Renzo’s for the past two-plus years and also competes in tournaments. Back in July, Ottavia got her famous husband and a few friends to hit the mats. And Bourdain took a liking to it. "I felt strangely elated and even proud of myself afterwards," he told Fightland. "I hate exercise, as you know. But this seemed to have a point to it. I actually had fun. And came away feeling strangely good about the world. I’d actually consider doing it again. In fact, I will do it again. And this is a major development." Indeed he did. And he says he’s stuck to it, something you have to admire for someone who has as hectic a travel schedule as he does. All of this is great news — for everyone. Because maybe this means he can put Guy Fieri in a very tight, rear-naked choke and save the world forever. We’re sure he would have no reservations about that.